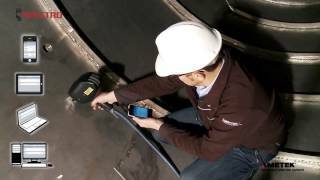 The SPECTROTEST is a mobile arc spark spectrometer ideal for many applications in the metal producing, processing, and recycling industries. This mobile metal analyzer flaunts its superior performance especially when exact metal analysis is required, when materials are difficult to identify or when there is a large number of samples to be tested. The new readout system and iCAL 2.0 diagnostics software upgraded the SPECTROTEST and allows users perform a single-sample standardization (in less than 5 minutes) at the start of the day’s testing and the iCAL diagnostics now helps to maintain the same standardization, regardless of most temperature shifts. The complex arc spark spectrometer design offers many ergonomic advantages for safe and fatigue-free onsite operation. The light, thin probe is quickly converted between arc excitation and spark excitation (arc spark OES). A probe with an integrated UV optic is available for special measuring applications; it can also be utilized with arc excitation. This arc spark spectrometer is even able to identify low alloy steel with the carbon content during the rapid arc excitation mode. In spark mode, the SPECTROTEST’s analysis of carbon phosphorous and sulfur are potential applications in addition to the identification of duplex steels using the nitrogen content. Watch video demonstrations of the SPECTROTEST – or click here to switch to SPECTRO on YouTube.com. iCAL 2.0 enables our mobile analyzers to deliver unsurpassed stability, even in the face of ambient temperature changes. The proven iCAL logic system monitors the correct state of the measuring system independently from external influences. This eliminates time-consuming recalibration of the spectrometer. iCAL is a unique one sample standardization of the entire system. Watch the video to get more information about iCAL. Recycling aluminum alloys is beneficial both financially and environmentally and has become a major industry in its own right. There are two major reasons for this: firstly, aluminum alloys are particularly amenable to recycling and can be recycled many times without losing their properties and secondly, huge energy savings are possible as recycling uses only 5% of the energy required to extract and refine new aluminum. Many specialized aluminum alloys have been developed for applications such as aviation and the automotive industry and these command premium prices, both as new material and scrap. It is therefore in the best interest of the recycler to identify input material and separate the various grades before processing. This is best done by elemental analysis. Laboratory analysis is sometimes not feasible or necessary and expensive and can involve unacceptable delays. But modern mobile and portable analyzers are available that can handle the necessary analyses on site to provide accurate and positive material identification even when used by non-specialist operators. This paper describes two such instruments from SPECTRO Analytical Instruments, the SPECTRO xSORT hand-held metals analyzer, the SPECTROTEST mobile emission spectrometer and the portable metal analyzer SPECTROPORT, and their application to the analysis of aluminum alloys. Handheld X-ray fluorescence (XRF) analyzers are useful for many elemental measuring tasks across numerous industries and applications. Advanced models — such as the SPECTRO xSORT handheld XRF spectrometer from SPECTRO Analytical Instruments — produce fast, accurate results on the spot, for sample identification, grade sorting, and metals analysis involving elements from magnesium to uranium. However, XRF technology faces significant limitations for certain elements. 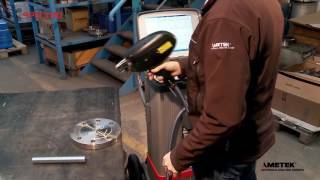 These constraints make it difficult or impossible to get satisfactory performance from handheld XRF in a number of applications. This report highlights these challenging elements — including carbon, sulfur, phosphorus, aluminum, silicon, magnesium, lithium, beryllium, and boron. It explains how they may instead be routinely analyzed by mobile optical emission spectrometry (OES) instruments. Examples include the SPECTROTEST mobile arc/spark OES metal analyzer and the SPECTROPORT portable arc/spark OES metals analyzer. Each can easily analyze the particularly challenging elements that handheld XRF technology cannot. Explosions, fires, and other incidents in industrial environments receive wide publicity. Financial losses to operators and insurers can easily run to many millions of dollars. Not infrequently, these incidents are traced to the use of piping, valves, and similar components made of inappropriate materials. In many cases, the presence or absence of a particular alloying element in a steel component is critical to its performance but impossible to detect by physical inspection. It’s why today, spectrometric analyzers have become vital components for the performance of PMI in these environments. This new paper reviews several situations that occur regularly and then explains the leading technologies and the instruments that are most effective in detecting the inappropriate alloying elements. Sample test results are included to demonstrate each instrument’s analytical capability. Is the metal or metal alloy you’re working with the right one? Does it have the chemical composition that your supplier promised, your process needs, your customer demands, or your product requires? Metal mistakes and counterfeits are impacting supply chains worldwide. Accepting the wrong alloy at the shipping dock or on the factory floor can mean anything from a troublesome batch rework to a catastrophic loss of business. So for metal producers, metal processors, metal dealers, or service contractors worldwide, inspecting incoming and outgoing metals and their alloys has become a critical quality control (QC) task. However, outsourcing metal sample testing to third-party laboratories introduces considerable time and expense. Even sending samples to an in-house lab can mean significant delays. Fortunately, there’s a class of instruments that lets users analyze their metal samples on the spot — easily, accurately, and affordably. This paper highlights some key capabilities of today’s mobile metal analyzers (MMAs). With many steel products, analysis isn’t simple. You must distinguish small differences in elemental composition between grades and the steel’s carbon content is critical. It helps determine characteristics such as weldability, hardening, and corrosion resistance. The core problem is that handheld analyzers lack the ability to determine carbon content. So some users bring samples into the lab for testing on sophisticated spectrometers. Others incur the potential risk of not testing carbon content at all. measure the carbon content of steel or provide fast alloy sorting based on carbon content — on the dock or at the line. MMA-1: Analysis of Aluminum and its Alloys (SPECTROTEST TXC03) The SPECTROTEST employs the very latest in state-of-the-art optical and electronic technology. The instrument is optimized for mobile use. This could be realized with the help of mechanical components constructed with the help of finite elements method. The result is an optical system that is extremely stable with respect to temperature changes. The proprietary optical design, using multiple CCD detectors, provides complete wavelength coverage and the resulting ability to select the best element wavelength to perfectly match the analytical task. A complete analysis takes about 10 seconds (s) and the standard element selection includes all relevant elements. This report details the concentration ranges as well as the exceptional precision data that can be achieved at various concentration levels for these elements. The instrument can be used for material analysis as well as for fast grade identification in arc mode. SPECTRO offers a comprehensive set of adapters for samples of differing geometry as well as software for data management, transmission and statistical evaluation. MMA-10: Identification of Low Alloy and Chrome Steels Using Carbon with Arc Excitation (SPECTROTEST TXC03) The SPECTROTEST employs the very latest in state-of-the-art optical and electronic technology. The instrument is optimized for mobile use. This could be realized with the help of mechanical components constructed with the help of finite elements method. The result is an optical system that is extremely stable with respect to temperature changes. The proprietary optical design, using multiple CCD detectors, provides complete wavelength coverage and the resulting ability to select the best element wavelength to perfectly match the analytical task. A complete analysis takes about 5 seconds (s) and the standard element selection includes all relevant elements. This report details with some calibration examples what can be achieved for carbon in those alloys. The instrument can be used for material analysis as well as for fast grade identification in arc mode. SPECTRO offers a comprehensive set of adapters for samples of differing geometry as well as software for data management, transmission and statistical evaluation. MMA-11: Analysis of Solid Precious Metal Samples Excitation of the fluorescence radiation in the sample by an X-ray tube has been optimized so that even in short measuring times the required precision for the analysis of Gold and Silver based jewelry alloys can be achieved. The analysis screen supplies the operator with all of the necessary information at a single glance and can display the measurement result in different views - also during measurement. The analytical results are stored and can be displayed later, printed and, after transfer to an external computer, processed with the “Result Manager” software. MMA-2: Analysis of Steel and Cast Iron (SPECTROTEST TXC03) The SPECTROTEST employs the very latest in state-of-the-art optical and electronic technology. The instrument is optimized for mobile use. This could be realized with the help of mechanical components constructed with the help of finite elements method. The result is an optical system that is extremely stable with respect to temperature changes. The proprietary optical design, using multiple CCD detectors, provides complete wavelength coverage and the resulting ability to select the best element wavelength to perfectly match the analytical task. A complete analysis takes about 10 seconds (s) and the standard element selection includes all relevant elements. This report details the concentration ranges as well as the exceptional precision data that can be achieved at various concentration levels for these elements. The instrument can be used for material analysis as well as for fast grade identification in arc mode. SPECTRO offers a comprehensive set of adapters for samples of differing geometry as well as software for data management, transmission and statistical evaluation. 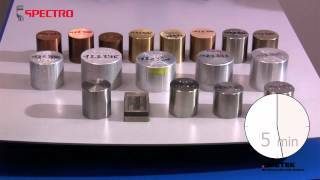 MMA-3: Analysis of Copper and its Alloys (SPECTROTEST TXC03) The SPECTROTEST employs the very latest in state-of-the-art optical and electronic technology. The instrument is optimized for mobile use. This could be realized with the help of mechanical components constructed with the help of finite elements method. The result is an optical system that is extremely stable with respect to temperature changes. The proprietary optical design, using multiple CCD detectors, provides complete wavelength coverage and the resulting ability to select the best element wavelength to perfectly match the analytical task. A complete analysis takes about 10 seconds (s) and the standard element selection includes all relevant elements. This report details the concentration ranges as well as the exceptional precision data that can be achieved at various concentration levels for these elements. The instrument can be used for material analysis as well as for fast grade identification in arc mode. SPECTRO offers a comprehensive set of adapters for samples of differing geometry as well as software for data management, transmission and statistical evaluation. MMA-4: Analysis of Nickel and its Alloys (SPECTROTEST TXC03) The SPECTROTEST employs the very latest in state-of-the-art optical and electronic technology. The instrument is optimized for mobile use. This could be realized with the help of mechanical components constructed with the help of finite elements method. The result is an optical system that is extremely stable with respect to temperature changes. The proprietary optical design, using multiple CCD detectors, provides complete wavelength coverage and the resulting ability to select the best element wavelength to perfectly match the analytical task. A complete analysis takes about 10 seconds (s) and the standard element selection includes all relevant elements. This report details the concentration ranges as well as the exceptional precision data that can be achieved at various concentration levels for these elements. The instrument can be used for material analysis as well as for fast grade identification in arc mode. SPECTRO offers a comprehensive set of adapters for samples of differing geometry as well as software for data management, transmission and statistical evaluation. MMA-5: Analysis of Cobalt and its Alloys (SPECTROTEST TXC03) The SPECTROTEST employs the very latest in state-of-the-art optical and electronic technology. The instrument is optimized for mobile use. This could be realized with the help of mechanical components constructed with the help of finite elements method. The result is an optical system that is extremely stable with respect to temperature changes. The proprietary optical design, using multiple CCD detectors, provides complete wavelength coverage and the resulting ability to select the best element wavelength to perfectly match the analytical task. A complete analysis takes about 10 seconds (s) and the standard element selection includes all relevant elements. This report details the concentration ranges as well as the exceptional precision data that can be achieved at various concentration levels for these elements. The instrument can be used for material analysis as well as for fast grade identification in arc mode. SPECTRO offers a comprehensive set of adapters for samples of differing geometry as well as software for data management, transmission and statistical evaluation. 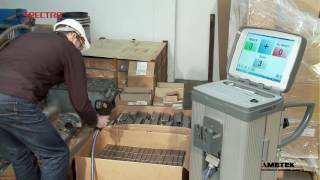 MMA-6: Analysis of Titanium and its Alloys (SPECTROTEST TXC03) The SPECTROTEST employs the very latest in state-of-the-art optical and electronic technology. The instrument is optimized for mobile use. This could be realized with the help of mechanical components constructed with the help of finite elements method. The result is an optical system that is extremely stable with respect to temperature changes. The proprietary optical design, using multiple CCD detectors, provides complete wavelength coverage and the resulting ability to select the best element wavelength to perfectly match the analytical task. A complete analysis takes about 10 seconds (s) and the standard element selection includes all relevant elements. This report details the concentration ranges as well as the exceptional precision data that can be achieved at various concentration levels for these elements. The instrument can be used for material analysis as well as for fast grade identification in arc mode. SPECTRO offers a comprehensive set of adapters for samples of differing geometry as well as software for data management, transmission and statistical evaluation. MMA-7: Grade Identification Using the Nitrogen Content in Fe Base (Duplex Steels, High Alloy Austenite) (SPECTROTEST TXC03) The SPECTROTEST employs the very latest in state-of-the-art optical and electronic technology. The instrument is optimized for mobile use. This could be realized with the help of mechanical components constructed with the help of finite elements method. The result is an optical system that is extremely stable with respect to temperature changes. The proprietary optical design, using multiple CCD detectors, provides complete wavelength coverage and the resulting ability to select the best element wavelength to perfectly match the analytical task. A complete analysis takes about 10 seconds (s) and the standard element selection includes all relevant elements. This report details the concentration ranges as well as the exceptional precision data that can be achieved at various concentration levels for these elements. The instrument can be used for material analysis as well as for fast grade identification in arc mode. SPECTRO offers a comprehensive set of adapters for samples of differing geometry as well as software for data management, transmission and statistical evaluation. MMA-8: Analysis of Steel within 5 s in Spark Mode (SPECTROTEST TXC03) The SPECTROTEST employs the very latest in state-of-the-art optical and electronic technology. The instrument is optimized for mobile use. This could be realized with the help of mechanical components constructed with the help of finite elements method. The result is an optical system that is extremely stable with respect to temperature changes. The proprietary optical design, using multiple CCD detectors, provides complete wavelength coverage and the resulting ability to select the best element wavelength to perfectly match the analytical task. A complete analysis takes about 5 seconds (s) and the standard element selection includes all relevant elements. This report details the concentration ranges as well as the exceptional precision data that can be achieved at various concentration levels for these elements. The instrument can be used for material analysis as well as for fast grade identification in arc mode. SPECTRO offers a comprehensive set of adapters for samples of differing geometry as well as software for data management, transmission and statistical evaluation. Click on the link below to further explore the SPECTROTEST.